The expansion of the Cape Town International Convention Centre (CTICC) will attract more events and business opportunities to Cape Town and will be a key catalyst in spurring economic growth and job creation. “One of the key considerations of the expansion project was to contribute to wealth creation in the province. An empowerment framework was drawn up to drive the expansion project , especially as it relates to spreading the benefit of the expansion to as many local and small businesses as possible,” said CTICC Board Chairperson Gary Fisher. CTICC East is expected to create in excess of 3000 direct and indirect sustainable jobs by 2020. “These job opportunities are the result of the centre’s business model and expansion strategy, creating sustained job creation well into the future,” said Fisher. The empowerment framework recommends that an estimated 54% of the project construction value be sourced from BEE and SMME suppliers, and 50% of all products and materials would be sourced within a 400km radius of Cape Town. “The current procurement legislation sets certain legislative targets, and codes that must be adhered to. But in terms of broadening the impact of a particular capital expenditure project, we have to broaden the entire value chain,” added Fisher. “In complex projects such as this, splitting the contract into smaller parts will ensure that it’s more locally biased and will spread opportunity allowing more SMMEs to take part in the construction of CTICC,” said Fisher. During the construction phase the main contractor will be one of the instrumental players while sub-contractors will focus on each of the different trades. The contracts will be tendered separately to broaden the economic impact. The sub-contractors will also have their own empowerment criteria to adhere to. “Through procurement, we have set targets that are realistic,” added Fisher. Fisher said that through a rigorous monitoring process, the CTICC will be able to track adherence – such as whether sustainable jobs have been created, for whom, where they stay and whether they actually exist. “This is not just about ticking boxes. The policy is to create opportunity through capital expenditure to previously disadvantaged communities, through adherence to the BEE codes and our own procurement policy. “Our passion is to make sure that this policy framework is seen through to implementation, that the economy grows, that SMMEs grow, and that companies grow. It will also ensure that high quality work is produced, on time, and the industry grows organically with a steady growth in turn-over for small and big players. If this is done correctly, everyone grows, everyone benefits, and everyone wins. 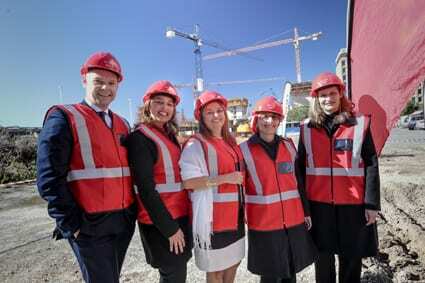 “CTICC already sustains around 7 000 jobs each year, and we expect this number to grow substantially as the work on CTICC East continues, and we get closer to the opening of our new venue,” concluded Fisher.